Buy this issue and make Skeets happy! Well Beetle seems real and not a figment of Boosters imagination. Thats rad. Though leaves Infinite Crisis and Boosters job as a time cop in flux. 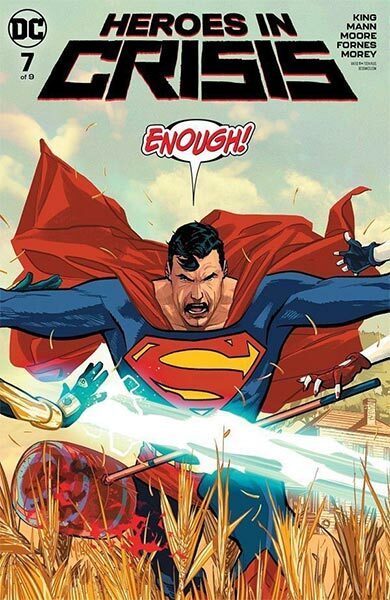 Although shown otherwise in Action Comics. Or maybe Ted came back after? Hrmn. Alas. Pretty art, and I kinda liked some parts though lately this all feels like a dream sequence. Or some stimulation. Everyone is acting just a bit off, almost intentionally. Curious of next two issues. Very curious. Okay. Ted Kord is alive and well in the Rebirth Universe. Restored after the time line changes, and whatever the New 52 did. I overthought it. The Wally revelations make this more like a finding the killer in a sealed room puzzle. One is assuming he offed himself. One is assuming the outcome can be changed, too. "Everyone is acting just a bit off" is, I think, the best way to describe Tom King's writing. I continue to suspect that he and I grew up reading very different DC comic books. If a villain held ten hostages and Booster Gold freed four of them, how many hostages remain? If you owned two Booster Gold comics and then bought nine more, how many total comics do you have? If there were ten villains, and Booster Gold defeated six of them, how many villains remain? The Superman/Booster Gold team-up continues in today's Action Comics #996. "Booster Shot" Part 4 is the first not to feature Booster on both covers. Therefore, it's okay if you buy only one copy this week. 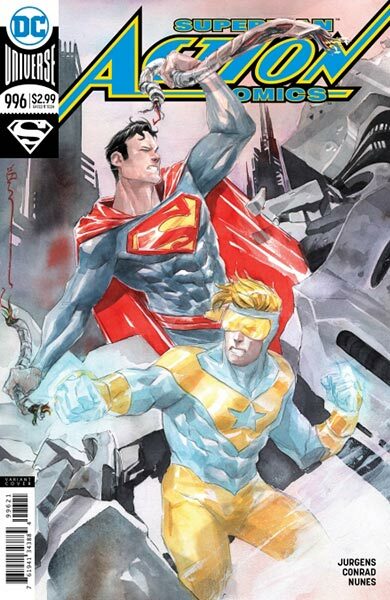 (The "variant" cover with Booster Gold is by Dustin Nguyen). Go to DenOfGeek.com to read the preview, then go to your Local Comic Shop to buy the issue and make Skeets happy! If you had nine dollars and then spent five dollars on Booster Gold comics, how many dollars do you have left?